1. In a well-seasoned Lodge cast iron skillet heat 2 tablespoons of the butter over medium-high heat. Add the onion and cook for 2 minutes, turning, until tender. 2. Reduce heat to low, sprinkle onion with sugar, salt, and black pepper, and cook for 20 minutes, stirring occasionally, until well caramelized. 3. Remove from heat and toss with tarragon and parsley; set aside to cool. Using 2 tablespoons of softened butter, brush the outsides of each roll half with butter. 4. Using a fork, combine the remaining 2 tablespoons of softened butter with Gorgonzola cheese into a smooth spread. Spread the insides of each roll half with the Gorgonzola spread. Add caramelized onion mixture to each sandwich, dividing evenly. 5. Top each with one-quarter of the ham, them layer with the Gruyere cheese. Top with remaining roll half and place on a hot Lodge grill pan. 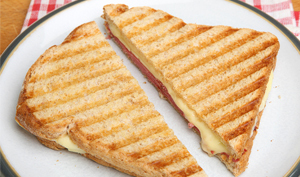 Press with a hot panini press, cooking on both sides for 7 minutes, until the cheese is melted. Remove and serve hot.